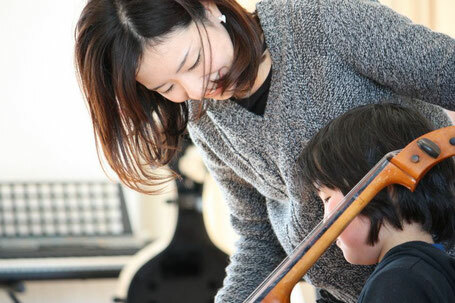 Hello, my name is Nanako Okuda and I am offering cello lessons to students,kids or beginners of all ages in the city of Tokyo! I can teach in english,german and japanese. depending on the area with extra travel expenses. Cellist Nanako Okuda started to play the Cello at the age of 10. She entered the high school of Geidai (Tokyo National University of Fine Arts and Music) in 2000, and then went on to study in Germany from 2003 at Staatliche Musik Hochshule Freiburg. In 2007 she moved to Berlin to continue her studies at the Universität der Künste Berlin, and graduated with Diplom and Konzertexamen. She had received scholarships from Cultural Affairs Agency of Japan and Rohm Music Foundation. Her teachers include Kaeko Mukoyama, Fumiaki Kohno, Christoph Henkel, Markus Nyikos and Wolfgang Boettcher. She has performed as a soloist with orchestras including the Baden=Baden Philharmonic Orchestra, Japan Century Orchestra, and has given many solo recitals all over Japan including her debut Recital in 2008 at the Aoyama Barock Saal in Kyoto. In 2014 her performance was live broadcasted on NHK radio "Recital Nova". After returning to Japan in 2011, she was Vorspieler at the Hyogo Performing Arts Center Orchestra in Japan for two years. Now she is based in Tokyo, and performs many solo and orchestral concerts actively.